For the second time in four years, Chicago Blackhawks players arrived at the White House to be honored by the United States President Barack Obama. 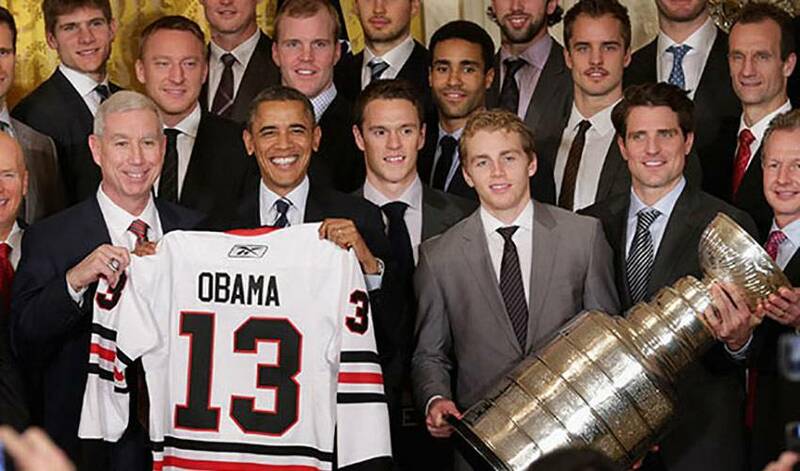 In a speech dedicated to his favourite NHL team, President Obama touched on the moments that defined their playoff run – highlighting Captain Jonathan Toews’ impressive leadership skills at the young age of 25, Andrew Shaw’s toughness, and Dave Bolland and Bryan Bickell’s clutch timing. Both Bolland and Bickell scored two separate goals within 17 seconds in the final moments of game six to secure the Stanley Cup win. The President also tipped his hat to Duncan Keith’s ability to balance the birth of his son with helping secure a meaningful win during the run for the Cup, and even joked around about Corey Crawford’s victory parade speech, stating he was planning on letting Crawford speak, but opted not to in order to keep the event family-friendly. Prior to meeting with the President, the Chicago Blackhawks paid a visit to the Walter Reed National Military Medical Center to thank the wounded U.S. warriors for their bravery and service to their country. The players spent time with the men and women at the medical center, taking photos, chatting with patients, and introducing them to the Stanley Cup. The team presented the President with an official Blackhawks jersey and posed with the Cup before capping off an exciting visit on Capitol Hill.